Tillandsia plants (also known as Air Plant, Sky Plant, or Pink Quill) receive moisture and nutrients through the leaves. Most Air Plants do not have roots. Some species do have roots; however, the roots are primarily used to anchor the plants in place. Since the roots do not absorb water, these plants gather moisture and nutrients through their leaves. One species, T. cyanea (Pink Quill), can be grown in a pot. 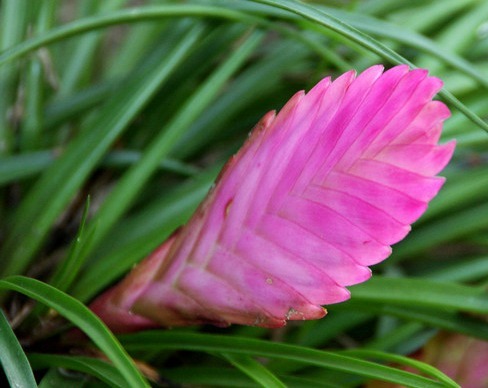 The Pink Quill bromeliad gets its name from the densely packed, overlapping, bright pink bracts that form a plume. Other tillandsia species are pinned, tied, or glued onto a mount, such as a piece of twisted wood or a large seashell. 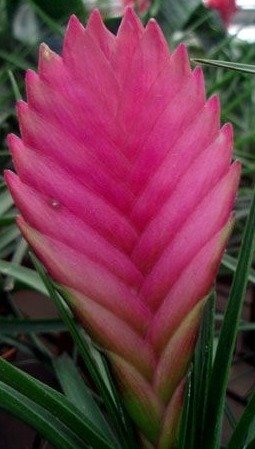 This bromeliad species blooms and then produces offsets. Most tillandsias reach maturity in three to five years. All Air Plant bromeliads are small plants with thin, dark green or greenish-gray leaves. They rarely grow more than 6 in/15 cm high and wide. If you are growing these plants outdoors, consider displaying them attached to tree ferns and other trees, or growing them in a rock garden. 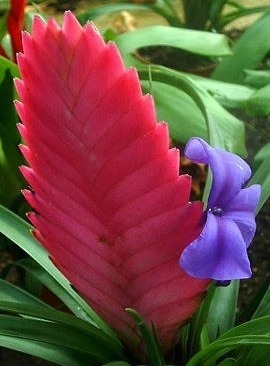 This bromeliad prefers bright light. Air plants will tolerate some direct sun in the winter, but not in the summer. In the spring, summer, and early fall, warm temperatures (80° F / 27° C) are ideal. In the winter cool temperature in the 60° F / 16° C range are best. In the spring and summer months, feed air plants every two weeks by spraying them with a high phosphorus fertilizer, diluted to ½ the normal strength. Leaf scales absorb the nutrients in the fertilizer. No fertilizer is required in the fall and winter months. Spray plants with water twice a week – make sure they are thoroughly wet. The plant should dry out in approximately four hours. Avoid soaking the base of the plant. No soil is needed for most varieties. Sphagnum moss can be used for air plants to rest on. Pink Quill can be grown in orchid potting medium. Propagate offsets when they are one-third the size of the parent plant. Drill small holes in a piece of untreated wood to create a temporary resting place for these pups. To accommodate new growth, reposition tillandsia plants as needed (approximately every two to three years. Individual plants live five years or more. Air plants are sold by their common names, or labeled as T. ionantha or T. usneoides (Spanish Moss). Pink Quill (T. cyanea), can be grown in a pot. Others tillandsia species can be pinned, tied, or glued onto a mount, such as twisted piece of wood or a large seashell.